Home > Car Care > When does the timing chain need to be replaced? We all know that a timing belt in a car engine needs to be replaced at recommended service intervals, but what about the timing chain? What is the difference between a timing belt and a chain? A timing belt is a toothed belt made of high-quality rubber; it runs outside of the engine, covered by a protective cover. 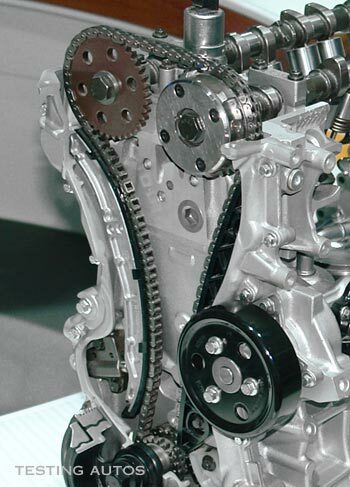 A timing chain is made of metal, similar to a bicycle chain. A timing chain runs inside the engine, as it needs to be lubricated by the engine oil. A timing belt typically needs to be replaced between 40,000 and 100,000 miles depending on the vehicle and it's a few hundred dollar repair. A timing chain doesn't need to be replaced unless there is a problem with it. Is the timing chain immune to mechanical failures? The simple answer is No, it is not. The timing chain problems are not uncommon, especially in high-mileage vehicles. Similarly to any other moving mechanical components inside any engine, a timing chain is subject to wear. A timing chain is lubricated by the engine oil. Lack of oil changes, low oil level or poor oil quality can cause the timing chain to wear faster. A timing chain is kept under proper tension by a chain tensioner. 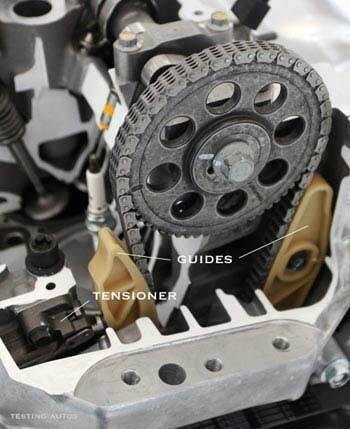 A chain tensioner could be operated by a spring-loaded mechanism or oil pressure. Timing chain, tensioner and chain guides. Chain guides and silencers are used to keep the timing chain from vibrating. All these components wear too. How do you know if the timing chain is worn? Often, if the timing chain is worn the engine may feel sluggish, low on power or have troubles starting. This is because as the chain wears out, it stretches and the ignition and valve timing becomes more retarded. A worn timing chain, guides or chain tensioner can also cause variety of noises originating from the timing chain cover area of the engine. The timing chain noises can range from rattling to whirring, whining or buzzing. If the timing chain is worn, usually it's replaced as a kit with a new tensioner, guides, and other parts of the chain drive mechanism. Many autos have two or even three chains in their motors and often your auto repair shop may recommend replacing all the chains at once. Prices for timing chain replacement may vary anywhere from $370 to $1,500 depending on the vehicle model. If you plan to replace a timing chain yourself, you will need to find the correct procedure to set the timing when a new chain is installed. You can find this type of information in the service manual for your vehicle. In old-style pushrod engines, replacing the timing chain is a fairly easy task. No such luck if you have a modern front-wheel drive car with a transversely-mounted engine, as the space in the engine compartment could be very tight. To avoid timing chain problems you should maintain your engine properly and have the engine oil changed at recommended intervals. Using premium quality engine oils and oil filters will also help. Keeping the proper oil level will ensure that the timing chain is always lubricated. In a well-maintained engine a timing chain can last up to 300,000 miles and even longer.